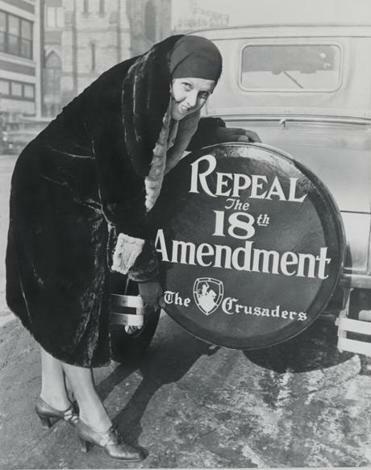 A woman “Crusader’’ in 1930. 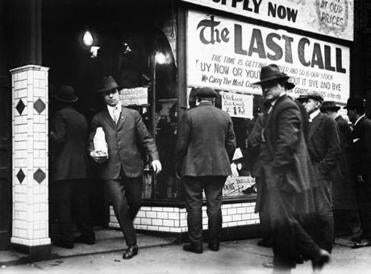 Citizens of Detroit heeding a "last call" in the final days before Prohibition went into effect. Has any piece of legislation had a more intoxicating effect on the American imagination than the 18th Amendment? That was the law that banned the manufacture and sale of alcohol from 1920 until its repeal, in 1933. Prohibition helped put the roar into the Roaring ’20s: speakeasies, hip flasks, bootleggers, bathtub gin, Al Capone. It proved to be a gold mine for popular culture, too: the original “Scarface,’’ “Some Like It Hot,’’ “The Untouchables,’’ and on and on. Yet this is a tricky subject for a documentary - let alone one that extends over three nights and runs 5 1/2 hours, as Ken Burns and Lynn Novick’s “Prohibition’’ does. It doesn’t faze them, though. The series presents an often-engrossing look at a unique cultural moment in America, when high-mindedness was in the saddle yet lawlessness was never so pervasive. “Prohibition’’ starts Sunday on Channel 2, continues Monday, and concludes Tuesday. The ’20s marked the birth of modern mass media, which means there’s a lot of material to be drawn on: newsreels, radio broadcasts, tabloid front pages, let alone countless photographs for Burns to pan over in his trademark fashion. Yet the era’s familiarity threatens to make any examination of it seem cliched and/or tired. And a serious treatment is really asking for trouble. Show all the blazing tommy guns and shuttered breweries you like, but underlying the battle between dries and wets was a set of conflicts far harder to present visually: country vs. city, native vs. immigrant, evangelical vs. secular. Those conflicts are inherently abstract, yet they defined Prohibition - and some of them remain as vexing today as they were 90 years ago. Or 190. Sunday’s episode, “A Nation of Drunkards,’’ looks at the 19th-century and early 20th-century roots of Prohibition. “For most of the nation’s history, alcohol was at least as American as apple pie,’’ narrator Peter Coyote says, and many people were not pie-eyed about this. A lot of them were female. The Women’s Christian Temperance Union was one of the champions of a dry America - the other was the Anti-Saloon League - and an irony of the prohibition movement (considered so illiberal today) was the extent to which it empowered women. Patricia Clarkson provides her voice. Even better are Paul Giamatti as bootlegger George Remus (heard in Monday night’s episode, “A Nation of Scofflaws’’) and Oliver Platt as Capone (Tuesday night’s “A Nation of Hypocrites’’). Not so good is John Lithgow as Prohibition’s foremost debunker, H.L. Mencken. Hearing Mencken’s words pronounced in Lithgow’s puckery tones is like having to sip single malt from a milk bottle. The best voice belongs to its actual owner: the gravelly bellow of New York Governor Al Smith, whose forthright opposition to Prohibition helped doom his presidential bid in 1928. One way Burns and Novick deal with the familiarity of Prohibition as a subject is to salt the documentary with little-known facts. The 16th Amendment, which created a federal income tax, enabled the 18th. Previously, something like 70 percent of federal tax revenues came from the taxation of alcohol. At the time Prohibition was instituted, the alcohol business was the fifth-largest in the country. Without an income tax, the government couldn’t have afforded Prohibition. Winston Churchill, no teetotaler he, denounced Prohibition as “an affront to the whole history of mankind.’’ Enough US citizens shared that opinion that during the ’20s this nation became the world’s largest importer of cocktail shakers. Many of them were presumably used in the estimated 32,000 speakeasies operating in New York. Chicago didn’t have as many speakeasies, but it had a lot more Prohibition-related murders: 76 in 1926, another 54 in 1927. When Capone was accused of having ordered the killing of an assistant state prosecutor, he denied it. 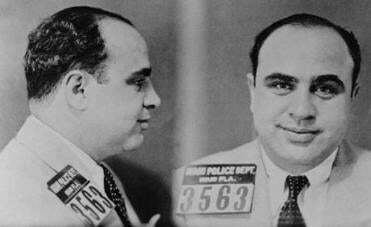 Not only had the dead man been his friend, Capone protested, he’d had him on the payroll. There are numerous talking heads in “Prohibition.’’ They range from the famous (former Supreme Court Justice John Paul Stevens, who was a boy in Chicago during the ’20s) to the unknown (several now-elderly children of bootleggers - and, oh, the stories they have to tell). Burns documentaries often have a majordomo: Shelby Foote in “The Civil War,’’ Buck O’Neil in “Baseball,’’ Wynton Marsalis in “Jazz.’’ (Marsalis had a hand in the excellent “Prohibition’’ soundtrack.) Daniel Okrent, a familiar face from “Baseball’’ and author of “Last Call: The Rise and Fall of Prohibition,’’ is the closest equivalent here. For all that it has the look and feel and sound of a standard Burns production, “Prohibition’’ marks a departure in two ways. It’s the first of his documentaries that acts as an implicit commentary on a current issue. There’s not a single overt reference to the war on drugs, but it’s hard to not feel its presence in the documentary’s final words, which belong to another talking head, the journalist Pete Hamill. It’s the better angels that have inspired Burns: Lincoln, Jackie Robinson, Lewis and Clark, the GIs of World War II, John Muir and the visionaries behind the national park system. Yet those same angels, removed from Lincoln’s tragic vision and plopped down on the PBS schedule, could have served as an excuse for soggy triumphalism and endless uplift. For at least three reasons, Burns hasn’t let that happen. There’s his phenomenal technique, for starters. The assurance and fluidity of the filmmaking on display in “Prohibition’’ are a marvel. Style this good doesn’t just serve content, it shapes and interrogates it. Then there’s Burns’s alertness to intellectual and ideological nuance. He shows that the nobility of the temperance cause having had such ignoble consequences makes that cause no less impressive. Finally, and most important, there’s the filmmaker’s fundamental tough-mindedness. And if you don’t think Ken Burns is tough-minded, you have no idea what it takes to make a living as a documentary filmmaker - let alone for three decades.